As a skydiving student, you learn your gear checks and emergency procedures. An instructor or coach goes over them every jump, and you do multiple iterations of practicing emergency procedures while on student status. When you get your A License, you’re released into the wild. After that, it’s easy to find complacency kicking in as you get down from a jump to pack, manifest, barely make the 10 minute call, do a quick dirt dive, discuss exit order as the plane rolls up, and before you know it you’re at 10,000 feet not knowing if your pilot chute is cocked. Yikes! So let’s talk about gear checks and emergency procedures. This information comes from the United States Parachute Association Skydiver’s Instruction Manual BUT before you implement any strategies you learn from the internet, ask your rigger, ask an instructor, or ask your S&TA (safety and training advisor) at your local dropzone to go over it with you. As a student you learn about skydiving gear checks, the most basic is the “check of three.” Your three-ring release, three straps, and three handles. It’s a good idea to build redundancy into your gear checks, so students are taught to do three checks of three. Once before you put on your gear, a second time before loading the airplane, and one more time in the aircraft before you jump. That’s just the minimum, so if at any time you feel like doing another gear check, do it! Especially if you’re a newer jumper, it will help you relax and enjoy the skydive. Three ring release system on a Mirage G4 container with reserve static line snap shackle. Inspect your three ring release system on each riser. Ensure that each ring passes through only one other ring. The white retaining loop should pass through only the topmost, smallest ring. The white retaining loop should pass through the cable housing terminal end. Additionally, the white retaining loop should show no more than 10% wear. The release cable should pass through the white retaining loop. The release cable should be routed into the cable housing. Make sure there are no burrs or chips on the release cable. 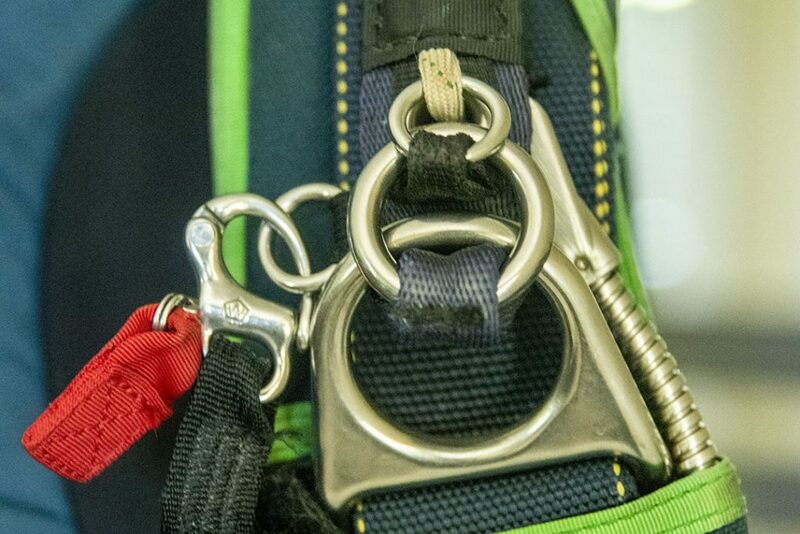 The reserve static line, if equipped, should have the snap-shackle assembled correctly so that pulling on the tab will release the shackle, and excess lanyard is stowed properly. Ensure that your three straps are routed properly. Your chest strap should be routed through the chest side of the buckle, then back underneath the sliding part of the buckle. Have someone tug on it to make sure it’s routed properly. Stow the excess with your rig’s elastic bands or a stow band. Make sure that both leg straps are properly routed through their buckles by tugging on them, and that excess strap is stowed in the leg strap pocket or with elastic bands. Make sure the cutaway handle is properly secured in the lateral strap. Then make sure the reserve handle is also secured in the lateral. If the rig has a D-ring cutaway handle, make sure the steel ball on the end of the cable is present. The lateral velcro should be strong enough to hold both handles, if not, pull off the jump and get your gear inspected. Always make sure to do a pin check. Multiple pin checks are better. This is one of the most common issues that could cause a serious incident when the airplane door is open. Pins get bumped quite a bit while moving around, so even if you just packed your own rig, always check before exiting. Check for correct bridle routing and make sure there is a bit of play in the bridle. The closing loop should show no more than 10% wear. Proper routing of the bridle on a Mirage G4 container. Just above the main closing pin on the bridle is a window where you can see the kill line. Most pilot chutes come with a marking on the kill line when the pilot chute is cocked. If you see the color on the line, your pilot chute is cocked. However, as the kill line starts to stretch out, the window may not show the colored line when the pilot chute is cocked, so you may have to re-color your kill line so it appears in the window when fully cocked. That way, when anyone else does a pin check on you, they can let you know your pilot chute is good to go. Make sure you’re checking pilot chute status as well when anyone asks you to do a pin check, and if it’s not colored, let that jumper know. Shoes: tied, double-knotted, and no hooks. Gloves: proper fit if you wear them. In the winter make sure they’re not too bulky otherwise it can interfere with operation of the main deployment handle, emergency handles, and canopy toggles. If you jump long enough, you’re going to have a cutaway. It’s best to approach every jump like this one is the one. That way, when it happens, you’ll have the habit built in. Practice your EPs. We like to practice EPs at least three times each jump, with every gear check. It’s also helpful to do it a number of times before you start jumping for the day. You will use these skills one day, so if you prepare like each jump is going to be a cutaway, you’ll be ready when it happens. Emergency procedures vary, so practice what your instructors taught you. The first thing that skydivers tend to forget about, is looking fore their cutaway handles before initiating emergency procedures. When your harness is under load, your cutaway handles are going to be in a different position than when you’re on the ground practicing. Under a high speed spinning malfunction, who knows where they could be! If you’re unsure about your EPs or just want to go over them again, grab an instructor and ask them to walk you through it with your gear on. There are always going to be inherent dangers when hucking yourself out of an airplane. Skydiving is not a safe sport! It’s a dangerous sport that can be done safely. As a self-regulated sport, it’s up to all of us to make sure we’re up to date on gear checks, emergency procedures, and looking after newer jumpers. Remember three checks of three, pin check, pilot chute.